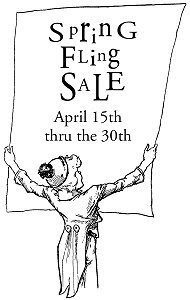 I'm having a "Spring Fling Sale" to celebrate the demise of old man winter. We had a couple of weeks of unusually cold weather this year that just might have killed off 1 or 2 of my bushes. I'm still hoping for signs that they're not complete goners. The weather has been getting milder and everything is starting to green up. So what better time to celebrate! From now thru April 30th you can save 20% off just about everything in stock (some exclusions) All savings will be refunded after transactions have been completed. It may take me a couple days to do the refunds so don't worry if it doesn't happen over night. Enjoy the mild weather while you can 'cause you know a hot summer is on the way! I'm looking for a couple of good artists to design & create projects using MadRat rubber stamps. While most small stamp companies use Design Teams that are only committed for a set period of time, I'm looking for 1 or 2 people that are willing and able to commit for the long haul. People that I can count on to produce consistently great artwork using my stamps and products and to promote MadRat on their own blogs, social networking sites like facebook, as well as forums, yahoo groups, etc., etc. MadRat Rubber is literally a "one woman show" I do it all and I just don't have time to create samples & projects or even post on my blog on a regular basis while trying to take care of everything else. Being a small business on the great big, world wide web, is a bit like being a needle in a haystack, it's hard to get found. So any word of mouth would be greatly appreciated. My requirements are that you are a regular blogger with a decent following, are familiar with various yahoo groups that specialize in stamping, and are active in stamping forums like splitcoaststampers, rubberstampchat, etc., and not least of all, able to produce impressive artwork with the kinds of images I carry. At this time I'm only able to pay for your services with free products as well as a commission on any sales you send my way. If things work out well, I hope to eventually offer a small monthly stipend as a retainer of sorts. If this is something you might be interested in, please contact me for more details and with any questions and include links to your blog or other places that showcase your work. Please, only serious inquiries welcome. 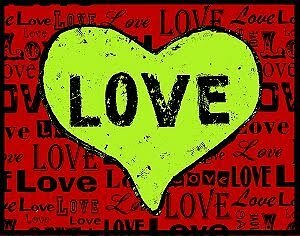 For quite a while now I've had a pretty dismal collection of images for Valentine's Day. Not that I've got anything against it, it's just that I'm not a frilly, gushy, kinda girl. (Though I did always appreciate my husbands gifts of roses & chocolates) And I have to confess, my timing has never been really good around that time of year, 'cause one has to plan ahead for these things. Ya know, images need to be gathered, drawn, planned etc. plates made, rubber made, announcements made, etc. etc. When one is a "one woman show" it sometimes hard to get all the things you want & need to do - done. This year I actually managed to do it though I'm cutting it close in getting the rubber out in time for my customers to have lots of time to play. And as usual I'm having a Pre-Sale to introduce them and I'm going to be placing my order for the rubber pressing anyday now. I think of Valentine's day as more of a "express your affections for those you love" kinda day, whether it's someone you have romantic feelings for, wanna sleep with, or family & friends. I think it's a good opportunity to let the people in your life know how you feel about them and it makes those people feel good that someone is thinking of them in a nice way. Kinda like how it was in grade school, everybody in class usually got a Valentine whether you really knew them or not. I think it made everybody feel a little special and there's certainly no harm in that! Oh yeah, about me being a realist & a mite cynical.. The images I've created of hearts, are overall "grunge" partly because, if we're honest with ourselves love can be a little messy. It's not all bon bons, pretty lace, blue birds singing, soulfull staring into each others eyes, etc., etc. You get my meaning, sometimes it's hard, sometimes it's messy, funny, frantic, impossible, ordinary, lonely and sometimes it hurts. We've all been through it at some time or another. And I thought having some images that can be used to express some of that messiness might be appropriate. Okay, the other line of reasoning for the "grunge" hearts is the vintage aspect, I love vintage stuff, and I think the hearts can speak to a more romantic vision. Think of unending love for the ages, or love without end or love standing the test of time (ooh, those sound like good ideas, I'll have to make a note for next year) I also saw the pop art aspect, after I had them laid out, it reminded me of Jim Dine's artwork & a little of Andy Warhol. So, that's my verbal bit about the stamps, go see them. And, if you're interested in the Vagabond Die Cut machine inspired by Tim Holtz, my sale is back on, here's the direct link. I'll be back later with a couple of comments about mine. I'm having a Cyber Week Sale! wrapped up into one week long event. I've been adding lots of new inventory lately including, Nunn Design Heart Pendants & punches, Memory Frames, glass and capsules, more Tim Holtz Idea-ology products including 2 sizes of the configurations & a few of his Cling Mounted Stamp Sets, plus library due date cards & pockets, envelope assortments and a Christmas Paper pack. I've also added several new Cling Mounted sets of MadRat Rubber. Good for gifting to your stamping pals. Inventory is limited on some items so shop early for best selection. Be sure to Enjoy the Holidays! This is a birthday card I made for my brother, his birthday was on November 7th - I'm a little late getting it to him since it's still sitting on my desk. Hopefully, it'll be a nice surprise when he does eventually get it. It's a puppet card, since he can actually be manipulated - the photo shows 2 poses. I used my Pierrot Doll stamp, as well as the Small Reaching Hands found on this Alice page. The Pierrot doll's hands are covered by his sleeves so I cut the ends off & used the small hands instead. I stamped each arm twice, then cut them so I could articulate them at the elbow, then joined the various parts using the Tim Holtz Idea-ology Mini Fasteners for the joints. They're the perfect size for this sorta thing. The doll parts were stamped onto a patterned paper then glued to "grunge paper" for extra resiliency. I hope it manages to make through the mail okay. 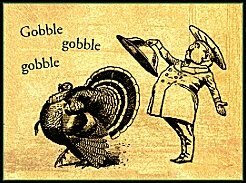 Save 20% off all in stock rubber stamps till midnight Monday November 1st. Save an extra 10% off select stamps scattered throughout the store. 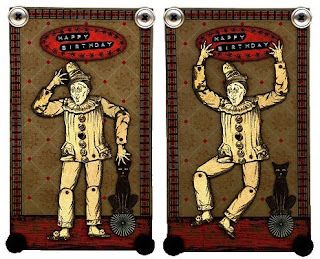 Orders with a subtotal of $25 (after any discounts are deducted)will get a free Tim Holtz Mini Mask while supplies last. I'm also having a Pre-Sale Sale on the Sizzix Vagabond Die Cut Machine. You may or may not know about it depending on your feelings for all things Tim Holtz. For those of you who do know, you can skip ahead. Tim Holtz is the "Grunge" rubber stamp guru and has several lines of products that he designs & represents and that carry his name. I've started adding his products to my website because, I gotta admit, some of them are kinda cool, well made & surprisingly affordable. I've been trying to highlight some of them on this blog, albeit, slowly. But right now I'm going to talk about the new "Vagabond Die Cut Machine" that's due to be released mid to late November. I don't currently have a die cut/embossing machine but have been thinking it might not be a bad idea to have one, since I am in the business and all that. My hesitation in getting one was, "what exactly I would do with it?" I felt they were kinda limited because one could only use specific dies & what if I didn't like any that were out there? And then I watched Tim's demo of it and the wheels started turning. It's supposed to be the most powerful die cut machine out there, according to Tim. And it will cut &/or emboss materials up to 1/8" thick, like cork board, felt, fabric, acetate, thin metals, etc. I got to thinking of some interesting things one might be able to use it for. I won't get into my ideas now but it's what decided me to get one for myself. The other deciding factor is that it closes up for easy storage and transport. It's also kinda visually appealing as it looks like a small vintage suitcase, although that's certainly not a reason to buy it. I did do a little research into other Sizzix machines out there and they do make a motorized version called the "Big Shot Express" with a regular retail price of $169.99 (on sale right now for $127.49). What I don't like about the Big Shot is it doesn't close up, it just sits there all exposed - in my messy studio, it'd get dirty fast, not to mention it makes storage &/or transport a little awkward. And if Tim's to be believed, the Vagabond is more powerful than a locomotive, um, I mean the Big Shot. So, them's the reasons I decided to get one for myself. Includes the Machine, the "Scallops" - On the Edge dies and cutting pads, Texture Fades embossing folders set (Damask & Regal Flourishes) & the "Caged Bird Die"
Regular price $368.00 - my price $312.80 + shipping. As far as I know, I'm the only one offering the starter kits which I think is a good idea if you're new to die cut/embossing machines, like me. If you already have a die cut/embossing machine than your dies may be compatible with this machine. The larger kit has dies that would work well for Christmas since it probably wont be shipped out until late November/early December. I won't be ordering the Vagabond for a week or 2 so you've got plenty of time to think about it. I'm a mixed-media artist living in a small town in the southwestern desert. I work in a variety of media which includes photography, woodworking, jewelry and mixed-media. I also own MadRatRubber, a small rubber stamp company that carries stamps as well as materials for the mixed-media artist. All rights reserved on all content unless otherwise noted. Please do not use any photos or content without my permission. Thank you. The Love Squared Art Doll will debut in the autumn issue of Art Doll Quarterly, on news stands Aug 1st. Oct 15 is the official day of the drawing. Donate to breast cancer research & get a chance to win the Love Squared Doll. 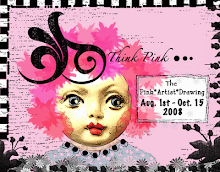 Click on the Think Pink image above for more details. The Love Squared Art Doll will debut in the autumn issue of Art Doll Quarterly, on news stands Aug 1st. Oct 15 is the official day of the drawing. Donate to breast cancer research & get a chance to win the Love Squared Doll. Click on the Pink Artist iamge above for more details.